Here are a few thoughts to illustrate how much learning can be accomplished in a morning of play… if ever I needed confirmation of the value of learning outdoors and the wellbeing it fosters, this morning gave it to me! 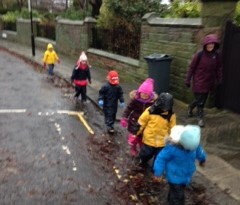 Cold and frosty, but not wet – unlike our two previous excursions to ‘Treespot’, a very favourite area not far from our nursery and so named by the children because they feel they are out in a forest. 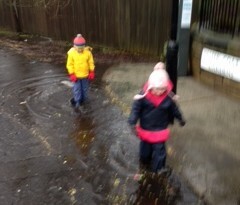 The weather might well have put some people off, but not our well clad and enthusiastic explorers! They journeyed chatting away, collecting sticks and generally behaving like ‘old hands’. Health and Wellbeing was clearly evident in all its aspects – from our risk assessments to the physical exertion, to the benefits of the fresh air, to the supportive interactions and conversations amongst the children and adults. 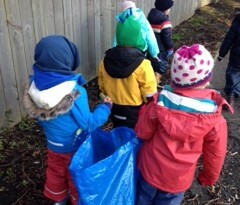 We met and spoke with people who have seen us out and about and we felt we had the ‘blessing’ of our local community. Science came in several forms. There was the acknowledgement that the bulbs we have been watching push their green shots upwards survived not only ‘Henry’s storm’, as the children call it, but the severe frost. There was the physics of balance and weight as we roped logs together and pushed and pulled them to make a seating area. 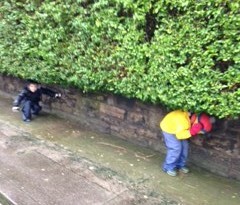 And on the nature side, the children have acquired an excellent knowledge of trees and birds, waterfalls and mud! Mathematics and Numeracy: 3D shapes became meaningful as the children erected shelters and fixed them down with tent pegs, as did the understanding of long/short and heavy/light. Counting was evident in many of the games they played, as was quantity. Literacy: Had I had a dictaphone I would have recorded some of the bones of creative writing which arose through role play and making scenarios for Stickman. Conversations appeared to be more meaningful than those which take place indoors and there was spontaneous laughter, turn-taking and recall demonstrated. 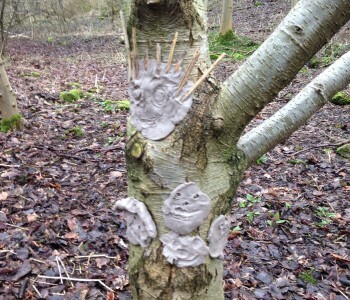 Expressive Arts manifested itself as the children used clay to make faces on tree trunks, adding features in detail using sticks and found straw, all the time giving running commentaries expressed in very descriptive terms. 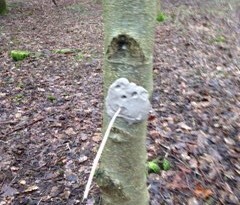 Several sculptures were created, in passing, with sticks, moss and mud. 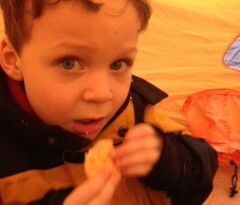 Give me a child until he is seven and I will give you the man! Why does our country put such a misplaced emphasis on formality in the early years of education? 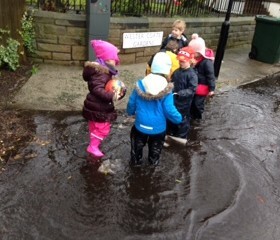 Today we learned so much and also developed confidence, independence and resilience. Had this been high on a teacher/practitioner’s agenda it would have been easy to be ‘accountable’ and link most of the above experiences to the learning outcomes of A Curriculum for Excellence, or to any other international curriculum! PS To help us spread the word about the importance of play, Alison also sent a newsletter to parents with information about Upstart.